Bariatric surgery significantly linked with increased levels of alcohol use and abuse is finding of a meta-analysis.Bariatric surgery is associated with improvement of obesity related co-morbidities but some studies suggest that these patients may be susceptible to alcohol abuse due to alteration in metabolism. Dr.Praneet Wander and associates conducted the study to assess the impact of bariatric surgery on high risk alcohol use in a meta-analysis of the published data of 28 studies involving nearly 16,000 patients and found that patients showed a statistically significant 8% higher rate of new-onset alcohol abuse, and a relative 50% increased rate of significant alcohol use, compared with rates before surgery. The researchers searched MEDLINE and Embase from inception through September 2016 with MeSH terms ”alcohol”, “substance abuse”, “outcomes”, and “bariatric surgery”. Dual extraction and quality assessment of studies were performed independently by two authors. Inclusion criteria were retrospective and prospective studies reporting long-term outcomes (>12 months) after bariatric procedures, with >100 patients in a cohort, and reporting rates of alcohol use as per the AUDIT, dSCID criteria and data from inpatient alcohol treatment. Primary outcomes included the pooled event rate and 95% confidence interval (95% CI) for significant alcohol use after bariatric surgery, new-onset significant alcohol use after bariatric surgery and odds ratio comparing rates of alcohol abuse before and after surgery. The authors identified 565 citations; 12 prospective and 16 retrospective or cross-sectional cohort studies including 15,714 subjects were analyzed. Average follow-up was 2.6 years(range 0.08-10 years). The average age of participants ranged from 26.5-50.1 years, with 76.8% female. 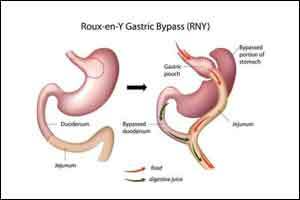 Majority of patients had undergone Roux-en-Y gastric bypass and fewer had laparoscopic gastric banding/other restrictive procedures. New-onset significant alcohol use was identified in 8% of patients after bariatric surgery. 19% of patients had significant alcohol use prior to bariatric surgery, event rate 0.19(95% CI 0.12-0.28,18 studies,4697 patients). 23% of patients had significant alcohol abuse after bariatric surgery; event rate 0.23(95% CI 0.14-0.34,I2=97%,Tau2=1.5,19 studies,4552 patients). Patients had higher odds of significant alcohol use after surgery than before, OR 1.5(95% CI 1.07-2.11,I2=89%,Tau2=0.3,11 studies,3370 patients). The authors concluded that Bariatric surgery is associated with significant increase in moderate to high-risk alcohol use/abuse with a new-onset incidence of 8%. Additionally, 19% of patients overall reported problem drinking prior to surgery. Thus, better selection of patients and further studies to identify modifiable factors are needed to decrease the substantial burden of high-risk alcohol use after bariatric surgery. Citation: RISK OF ALCOHOL ABUSE IS INCREASED AFTER BARIATRIC SURGERY: A SYSTEMATIC REVIEW AND META-ANALYSIS. Program No. 10. World Congress of Gastroenterology at ACG2017 Meeting Abstracts. Orlando, FL: American College of Gastroenterology. Following any of several methods of bariatric surgery, patients showed a statistically significant 8% higher rate of new-onset alcohol abuse, and a relative 50% increased the rate of significant alcohol use, compared with rates before surgery, Prandeet Wander, MD, said at the World Congress of Gastroenterology at ACG 2017. The findings suggest that “after bariatric surgery, patients require close follow-up and evaluation for psychiatric illness and substance abuse,” said Dr. Wander, a gastroenterology fellow at North Shore LIJ Hospital in Manhasset, N.Y. In addition, “screening for high-risk behaviors may help with better patient selection” for bariatric surgery, she suggested. Her meta-analysis identified prospective, retrospective, and cross-sectional studies of alcohol use that included more than 100 bariatric surgery patients and that had follow-up beyond 1 year. Patients could have undergone Roux-en-Y gastric bypass, sleeve gastrectomy, or laparoscopic adjustable gastric banding. Comparator populations had to be either the surgery patients prior to the procedure or the controls matched by age and body mass index. The 28 included studies enrolled 15,714 patients who averaged 43 years old, with more than three-quarters women. Follow-up averaged 2.6 years. The most common surgery was Roux-en-Y, used in 23 studies, followed by banding in 12 studies, and sleeves in 8 studies (some studies used more than one type of surgery). Nineteen of the studies examined the prevalence of “significant alcohol abuse” following surgery in a total of 4,552 patients, with 23% of patients overall showing this behavior. Five studies, involving 2,698 patients, documented the rate of new-onset alcohol abuse after surgery, with an overall rate of 8% that was statistically significant. All five studies individually showed the increased incidence of alcohol abuse, with rates that ranged from 4% to 8%. The analysis that showed a relative 50% higher rate of “significant” alcohol use after surgery, compared with the same patients before their surgery used data from 11 studies with 3,370 patients. Five of these 11 studies individually showed a statistically significant increase in alcohol use, 1 showed a significant, 34% relative decrease, and the remaining 5 studies did not show statistically significant changes, with 3 studies trending toward an increased rate and two trending toward a decreased rate after surgery. None of the 28 included studies had a randomized control arm, and the studies collectively ran in six countries, including the United States, and hence involved different societal norms of alcohol use. Changes in alcohol absorption and metabolism following bariatric surgery may play roles in the observed effects, as might undiagnosed depression or substance use by patients who undergo this surgery, Dr. Wander suggested.